“If I have any secret stash of poems, anywhere, it might be about love, not anger,” Mary Oliver once said in an interview. 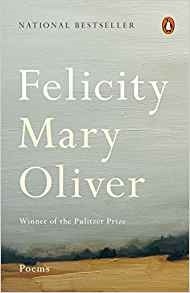 Finally, in this collection, Felicity, we can immerse ourselves in Oliver’s love poems. Here, great happiness abounds. Our most delicate chronicler of physical landscape, Oliver has described her work as loving the world. With Felicity she examines what it means to love another person. She opens our eyes again to the territory within our own hearts; to the wild and to the quiet. In these poems, she describes — with joy — the strangeness and wonder of human connection.